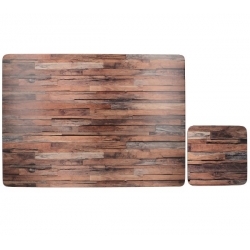 Add some raw rustic style to tables with these Wood Cabin placemats and coasters. 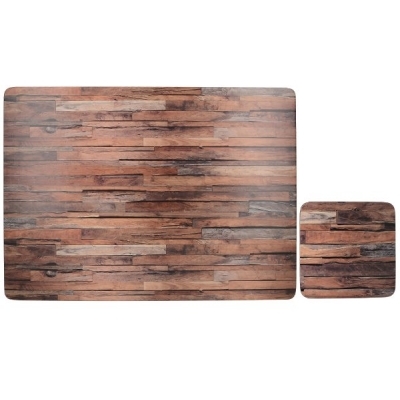 Reminiscent of a cosy cabin nestled in a secluded forest spot, each table mat and coaster shows a wall of multi-toned woods. Light, chestnut and dark woods mix together with rugged texture to add a natural touch to dining. LUXURY FINISH: These placemats and coasters feature a luxury lacquered surface finish making them smooth and silky to touch, stain resistant, easy to wipe clean, and able to withstand temperatures up to 120C. A lacquered edge finish adds durability and prevents moisture damage to the surface design. The 5mm thickness and high quality cork back makes these mats slip resistant and the perfect choice for those looking for the best quality.